If you want to learn how to be a super hero...read on! We are seeing a lot of movies, lately, about super heroes. Superman started it all and since then we’ve been bombarded with everything from Spiderman and Batman to Teenage Mutant Ninja Turtles and Underdog. I used to watch the Saturday morning television cartoon version of Spiderman when I was a kid…and yes, I was influenced by it. I always wanted to have a super alter ego where I would put on a mask and my voice would get deeper. ...and you could be one of them. What are some of the characteristics of a Super Hero? Super X-Ray Vision, Super Hearing, and Superhuman Strength are just a few of the traits. It started occurring to me that I knew people who fit in these categories. For example…Coach Scott had X-Ray Vision. When I played little league baseball, I was the child that the "athletic" kids picked on, not because I was wimpy or puny or un-athletic…no. They bullied me because I was a "goody-goody." That's what they called me, a "goody-goody!" I wouldn’t stray from my moral beliefs…I wouldn’t swear or look at indecent pictures or even hang around if they were telling dirty jokes. Their incessant teasing got to me. I was a really good baseball player, but the bullies kept telling me that I couldn't run as fast as them, or hit as well as them, or field the ball as well as them. I started believing what they were saying. Then one day we were playing an important baseball game and it was the classic bottom of the ninth, bases loaded, two outs and the game was tied. Coach Scott used his X-Ray vision and looked inside of me. He knew there was an excellent baseball player within me and he put me up as a pinch hitter at this significant part of the game. He believed in me…he made me believe in me. (Side Note: I am NOT a home-run hitter when it comes to baseball, however, I AM a superb base hitter. I can determine where I’m going to hit the ball...as long as it isn’t over the fence.) I hit the ball over the pitcher’s head so that it dropped into the shallow center field area. There was no way that they could get to it in time. Our runner scored and I was the hero of the game. But the truth is, I was not really the hero of the game. The real hero, the one with the Super X-Ray Vision was Coach Scott. He was, and still IS, a Super Hero!! Do YOU have the Super Power of X-Ray Vision? Can you look into somebody and see his or her real worth? If you can, then you are on your way to becoming a Super Hero. 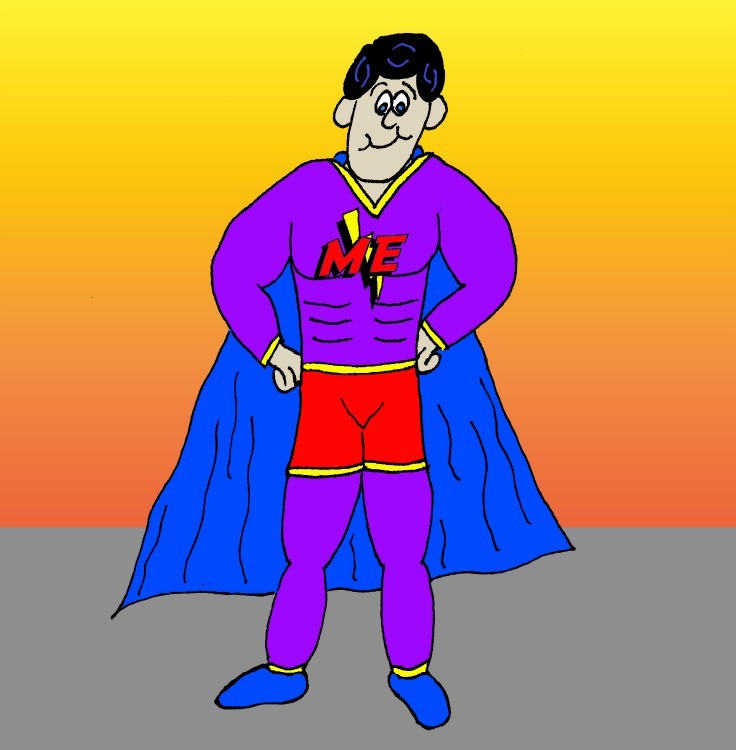 Another Super Hero was Miss McCauley…my fifth grade teacher: She had Super Hearing. Again with the kids teasing me…there would be times when I would come in from lunch or recess either nearing tears or already in “sob” mode…(I’m very tender-hearted). Miss McCauley took me aside one day and had me pour out my soul to her about what was going on. I didn’t think anything would come of it because I thought she was just letting me vent…I was wrong. She listened to me with her Super Hearing. She confronted the kids that were teasing me and she made sure my life was much better after that…she saved me with her Super Powers. (Side Note: The kids who were picking on me weren’t without their own sets of problems. One of the things that made her so super is that she listened to ALL of us and she used her Super Hearing to help improve EACH of our lives. She was the teacher that cared SO much that sent us all birthday cards until our 21st birthdays). She was, and still IS, a Super Hero. I was 8 years old and I was riding my bike down the sidewalk. All of a sudden, Melissa was right in front of me…I hadn't seen her and she hadn’t seen me until it was too late. I tried to swerve to the right, at the same time she tried to jump to her left…oops, same direction. I tried to swerve to the left while she tried to jump out of the way to her right…again, the same direction. I hit her with my bike. I felt sooooooo bad. I got off of my bike and helped her up, she was O.K…. just a couple of scrapes and possibly some future bruising. I told her how sorry I was. She said it was all right. She forgave me right then and there. (Side Note: I have seen this scenario before with other kids…even adults. Most of the time, the person who is hit starts crying [I’m sure that would be me] or yelling about retribution. But in very few instances have I seen someone instantly forgive the person who hit them...whether it was on purpose or not). Even at 5 years old, Melissa became a Super Hero to me because of her Super Human strength, for, you see, it takes Super Human Strength to forgive. Isn’t it amazing that I remember that story? That happened over 40 years ago, but it is still strong in my memory because Melissa was, and still IS, a Super Hero. So it doesn't matter how old you are, what gender or race you are...you CAN be a Super Hero. I know many other Super Heroes with other Super Powers. I'll probably write more stories about them in the future.